Ross, C.L., Falter, J.L. and McCulloch, M.T. 2017. Active modulation of the calcifying fluid carbonate chemistry (δ11B, B/Ca) and seasonally invariant coral calcification at sub-tropical limits. Scientific Reports 7: 13830, DOI:10.1038/s41598-017-14066-9. As we have previously pointed out on our website, however (see The End of the Ocean Acidification Scare for Corals and A Coral's Biological Control of its Calcifying Medium to Favor Skeletal Growth), such projections often fail to account for the fact that coral calcification is a biologically mediated process, and that out in the real world, living organisms tend to find ways to meet and overcome the many challenges they face; and coral calcification in response to ocean acidification is no exception. The latest study to demonstrate this fact comes from Ross et al. (2017). Using geochemical proxies (δ11B, B/Ca, Sr/Ca and Li/Mg), the three Australian scientists investigated seasonal changes in the pH and dissolved inorganic carbon (DIC) content in the calcifying fluid (cf) of two sub-tropical reef-building coral species (Acropora yongei and Pocillopora damicornis) from Salmon Bay on the south side of Rottnest Island (~32°S, 115°E). There, over the period February 2013-March 2015, the researchers performed geochemical analyses on coral samples from four naturally growing colonies at 1 to 3 month intervals. In discussing their findings, Ross et al. 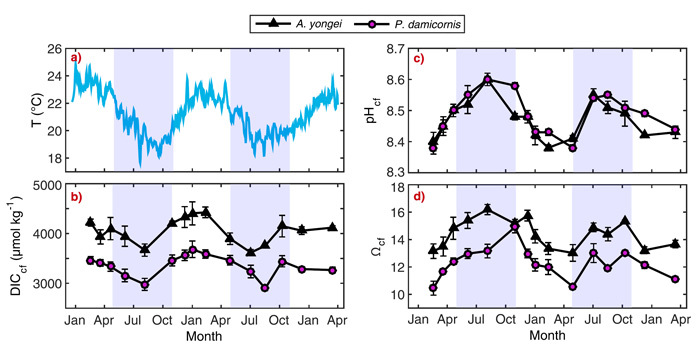 report that coral calcification rates were "either negatively correlated with temperature for P. damicornis or showed little or no seasonal coherency for A. yongei," exhibiting "unexpected patterns whereby they were, on average, similar across seasons for A. yongei, and slightly higher in winter compared to summer for P. samicornis." With respect to what may have compensated for the seasonal declines in temperature and light and kept calcification rates nearly constant during winter, the researchers note there was an inverse cyclical relationship between the pHcf and the DICcf, such that pHcf was highest in the winter (8.60) and lowest in the summer (8.38), while DICcf was lowest in the winter and highest in the summer (see Figure 1). The net effect of this counter-cyclical behavior between DICcf and pHcf, along with their up-regulation relative to that of the surrounding seawater, according to the authors, "is that the aragonite saturation state of the calcifying fluid (Ωcf) is elevated ~4 times above seawater values and is ~25 to 40% higher during winter compared to summer." As a result, Ross et al. conclude that "these corals [are able to] control the chemical composition of the calcifying fluid to help sustain near-constant year-round calcification rates, despite a seasonal seawater temperature range from just ~19 to 24 °C," adding that "such robust regulation of chemical conditions during calcification will help protect the growth of adult corals from the influence of declining seawater pH." Such proof that corals living in natural environments can biologically manipulate their rates of aragonite precipitation (i.e., calcification) by actively raising both pHcf and DICcf is a game-changing discovery in the field of ocean acidification research, demonstrating that, out in the real world ocean acidification will have little, if any, impact on coral growth. Figure 1. Time-series of seasonal changes in seawater temperature and calcifying fluid parameters (DICcf, pHcf, Ωcf) for the coral species Acropora yongei and Pocillopora damicornis. (a) Seawater temperature (b) pHcf, (c) predicted dissolved inorganic carbon (DICcf), and (d) Ωcf. Light purple shading denotes winter and unshaded areas denote summer, defined based on seasonal changes in temperature and light. Source: Ross et al. (2017).